There have been a number of official school publications over the years. 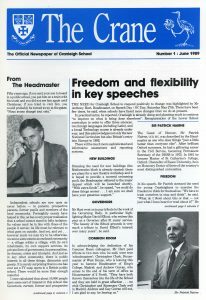 In 1989 The Crane appeared for the first time, ostensibly a four-page newsletter to keep parents informed about goings on in between the appearance of the annual Cranleighan, it was in reality a thinly veiled tie in with a new appeal from the School to raise funds for the building of the new swimming pool and what was to become the Vivian Cox Theatre. It ran for four years.